“Israel Horizons” has a distinguished pedigree dating back to 1952, when it was established by the Progressive Zionist Alliance, one of the many predecessors of PPI. It continued as a progressive Zionist magazine until 2011, when Meretz USA discontinued it. However, in November 2017, the same group, now PPI, reestablished it as a web publication coming out 8 times a year. 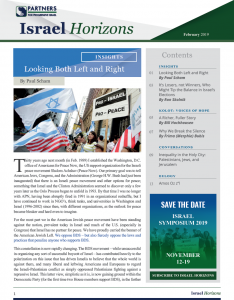 It’s been reinvented as a magazine that informs its audience, principally, but not only American Jews, about the activities, ideas, and issues of the Israeli left and its American supporters. IH is not a newsletter. Rather, it publishes almost only original pieces about issues and events, analyses of current developments, and book reviews, as well as publicizing upcoming events by PPI and of interest to our supporters. We generally have one or two articles by Israelis affiliated with Meretz. If you’d like to be on our mailing list, please signup below.